The INEC Chairman, Mr Jega is said to be currently under a lot of pressure to postpone the Nigerian presidential, gubernatorial and federal elections slated for Feb 14 and 21. While the nation waits for his final decision to be announced any time soon via a media conference, rumors swirl that a postponement is a done deal, read here. 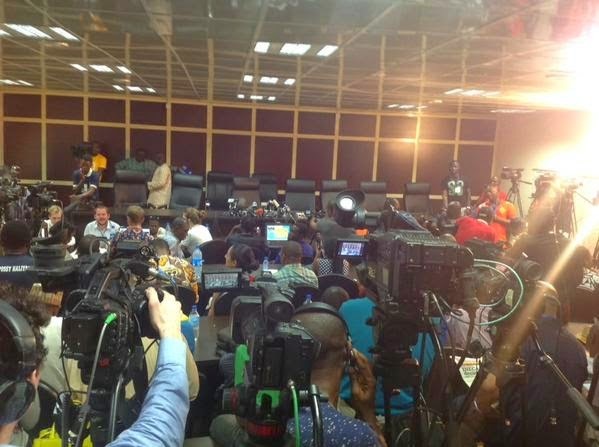 Journalists have been waiting endlessly at the INEC media centre today for INEC's chair Prof. Jega to confirm if the elections will hold or not. One of them, Fidelis Mba shared the photo above on Twitter. In the meantime, following a meeting by Jega with electoral commissioners, 21 of them are reported to have rejected the postponement of the elections. It was an initial meeting with the military and security chiefs that led to reports of the elections being postponed due to a clash with operations to rout Boko Haram in the North East of Nigeria. The civil society are said to be in support of continuing with the current schedule of elections. In a vote conducted Saturday by the INEC chairman, Attahiru Jega, after he met with political parties and the civil society, 21 RECs said the elections should continue as planned while 16 others voted in support of a reschedule. Nigeria has 37 RECs, each for a state and the Federal Capital, Abuja. After 17 political parties voted for a postponement as against 11 that argued for INEC to remain faithful to its time table, the mood across the land suggested that INEC will capitulate to a demand by military and security chiefs asking for a six weeks postponement on the presumed grounds that they have a special operations to we against the six year insurgency which appears to be spreading on a daily basis. Civil society leaders, organized in support of credible and transparent elections in Nigeria, otherwise called the Nigeria Civil Society Situation Room, reacted sharply blasting the security chiefs accusing them of fomenting a surreptitious coup against democracy. Speaking for the group in its statement, Agianpe Ashang, a senior programme officer at the Policy and Legal Advocacy Centre, PLAC, said the action of the security chiefs “amounted to blackmail [to] arm-twist the Election Management Body away from its constitutional guaranteed function of conducting elections.” The group them asked Nigerians to defend their hard won struggle to entrench democracy in the country. Jibrin Ibrahim, a senior fellow at the Centre for Democracy and Development, CDD, in Abuja, who was at the meeting, said Mr. Jega told the meeting that security operatives informed INEC that they were commencing a six weeks special operations against Boko Haram insurgents in the north eastern corridors of the country and would rather not be distracted by the elections.